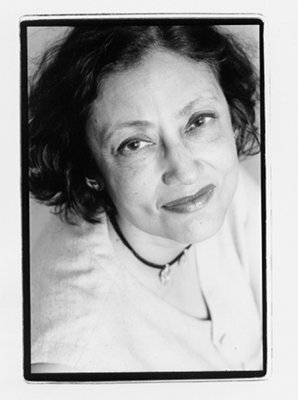 In a series of acclaimed novels and short stories published over more than 40 years, Bharati Mukherjee, who died in Manhattan on Jan. 28, wrote about the radical changes experienced by immigrants from India. 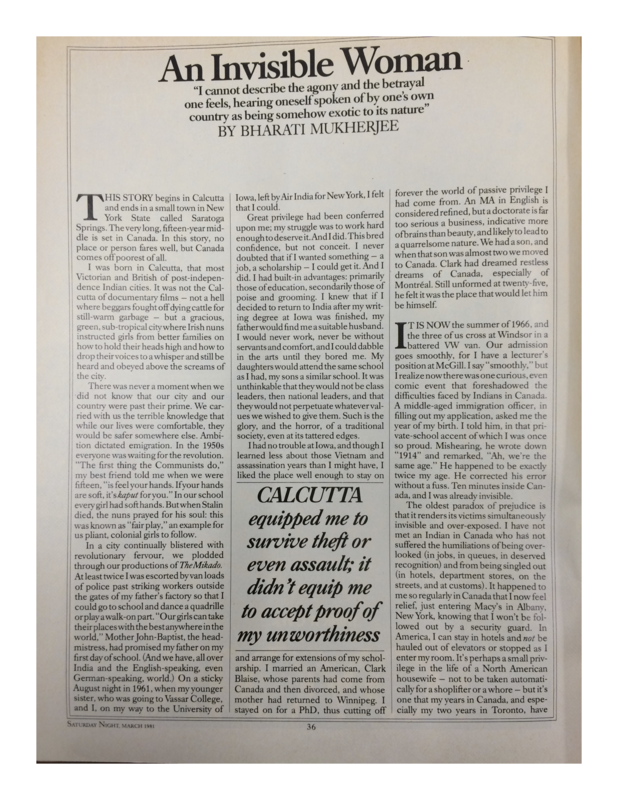 Her long-time friend Margaret Atwood called Ms. Mukherjee a pioneer in North America in her exploration of this kind of culture shock. Ms. Mukherjee was 22 when she enrolled at the Iowa Writers’ Workshop in 1962. She already had a BA from the University of Calcutta and an MA from the University of Baroda, in Gujarat, India. She was beautiful, elegant and accomplished. The other students thought she was the daughter of a maharajah who had an army ready to attack any man who so much as looked at her. Her father, Sudhir Lal Mukherjee, was the wealthy owner of a pharmaceutical company who took the family abroad when she was eight. Her mother, Bina (née Banerjee) was a homemaker. Bharati attended private schools in London and Basel, Switzerland, and then the elite Loreto House on the family’s return to Calcutta, which she described as “that most Victorian and British of post-independence Indian cities.” She was driven to school by a chauffeur and accompanied by a bodyguard – the city being “blistered with revolutionary fervour” – and she had never been to a party with boys before she arrived in Iowa. Mr. Blaise was what Ms. Atwood described as “a down home boy.” Born in North Dakota of Canadian parents, he had led a peripatetic life, mostly in Georgia and Florida. As a Brahmin, Ms. Mukherjee was meant to marry within that caste, but a year after their first meeting, she and Mr. Blaise had a whirlwind two-week romance. “By the time you read this,” she cabled her father, “I will be Mrs. Clark Blaise.” They were married in September, 1963, in a five-minute ceremony in an office upstairs from the coffee shop where he worked as a busboy. Ms. Mukherjee was born in Calcutta on July 27, 1940, and spoke only Bengali until she was three years old. She lived with her extended family, so there were 40 to 50 people living in the house at any one time. “Every room felt crowded,” she told an interviewer for the Commonwealth studies journal Span. “In order to make privacy for myself, make a little emotional, physical space for myself, I had to read. I had to drop inside books as a way of escaping crowds. As a result, I became a very bookish child, I read and read and read all day. A series of short-term academic positions followed, with Ms. Mukherjee and Mr. Blaise often living apart. Their marriage, which a Montreal friend, writer Ann Charney, considered “a great literary partnership,” survived. They co-wrote two works of literary non-fiction: Days and Nights in Calcutta, a memoir, and The Sorror and the Terror: The Haunting Legacy of the Air India Tragedy, about the 1985 bombing of Air India Flight 182, which killed 329 people. 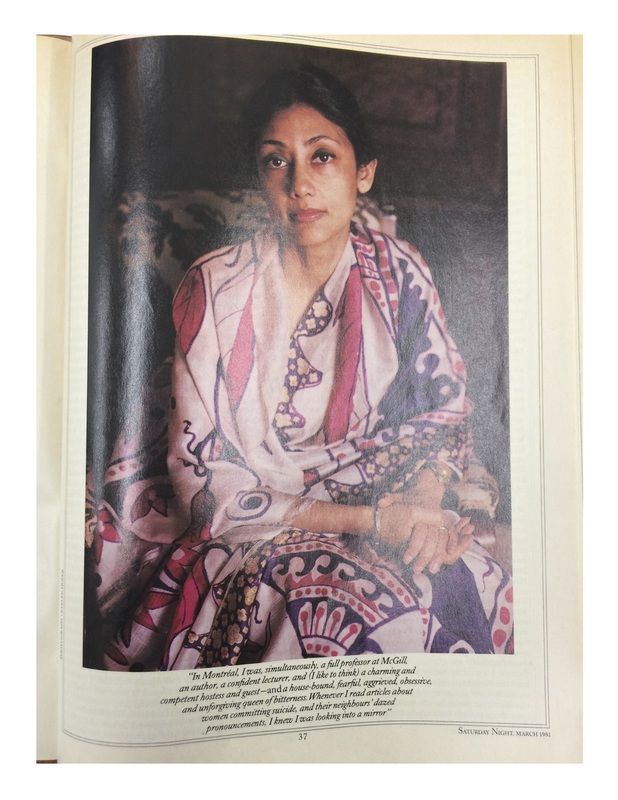 It was with her fiction, though, that Ms. Mukherjee made her name in the United States. 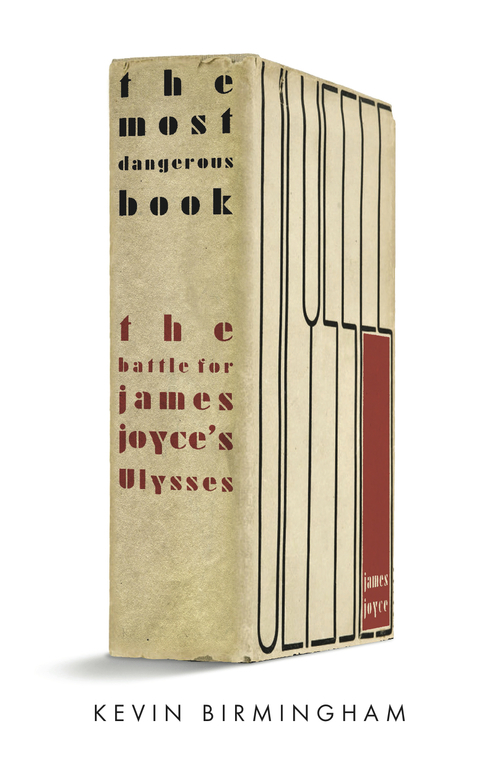 Her 1988 collection, The Middleman and Other Stories, won the National Book Critics Circle Award for Fiction – the first time the coveted prize had ever gone to a naturalized American. Her next novel, Jasmine (1989) features an illegal immigrant from the Punjab who marries an American. The year it was published, Ms. Mukherjee was hired at the University of California, Berkeley, where she taught until her retirement in 2013. Ms. Mukherjee died of complications of rheumatoid arthritis and takotsubo cardiomyopathy. She was 76. She leaves Mr. Blaise and their son Bernard and two granddaughters; she was predeceased by another son, Bart, in 2015.